The CMP Rimfire Sporter Rifle Matches offers shooters a recreation-oriented competition where they use .22 caliber sporter rifles (plinking and small game rifles) commonly owned by almost all gun enthusiasts. This is a unique match where all you need is a rifle and ammo. You fire with standard sporter-type rimfire rifles that can weigh no more than 7 ½ pounds, with sights and sling. Rifles may be manually operated or semi-automatic; shooters with manually operated actions are given extra time in rapid-fire to compensate for the difference. 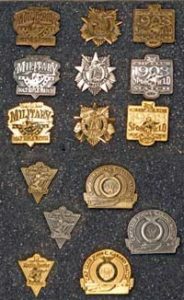 There are three classes of competition - the standard “O Class” for open-sighted rifles, “T-Class” for telescope sighted and rear aperture sighted rifles and “Tactical Rimfire” class, which is a .22 caliber A4 or AR15 style rifle. Firing for all classes is done at 50 and 25 yards on a target with a 1.78” ten-ring and an 18” outer one-ring. Even new shooters can get hits on this target, but it’s still tough enough that only one person has fired a perfect 600x600 score – a junior, Sam Payne, in 2015. 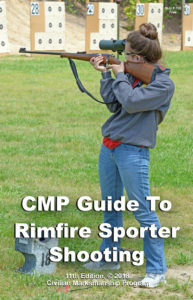 To learn more about Rimfire Shooting, download the Guide to CMP Rimfire Shooting or attend an upcoming match in your area. A CMP-sanctioned match or clinic is an event hosted or sponsored by a CMP affiliated organization where match sponsors agree to use CMP Competition Rules in conducting their events and clinic sponsors agree to follow CMP standards for the conduct of clinics. 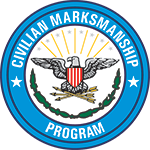 A CMP-sanctioned match or clinic is an event hosted or sponsored by a CMP affiliated organization where match sponsors agree to use CMP Competition Rulebook in conducting their events and clinic sponsors agree to follow CMP standards for the conduct of clinics.